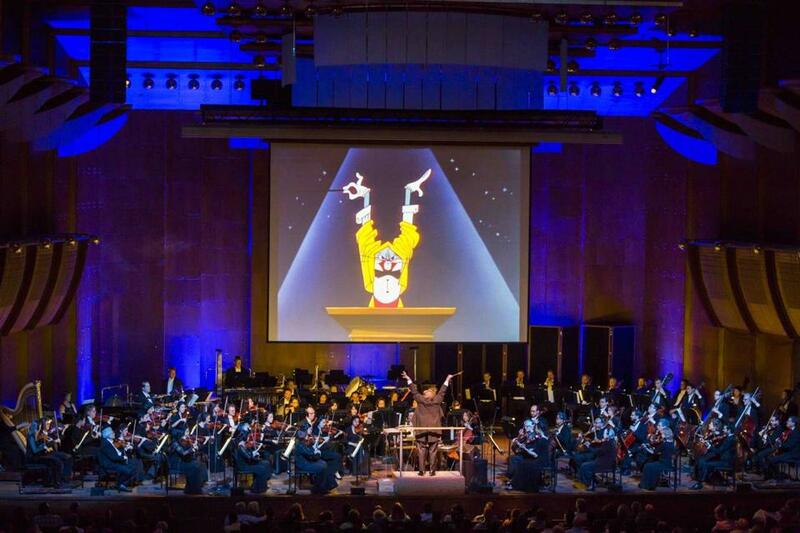 A performance of “Bugs Bunny at the Symphony” from the New York Philharmonic at Avery Fisher Hall in 2015. Unlike the New York Philharmonic and its Young People’s Concerts, composer Carl Stalling probably didn’t intend to give a generation of Americans an education in classical music. But his scores for Warner Bros. cartoons, which sample and reference music from all over the classical and popular song repertoires, have introduced countless children and adults alike to the music of Wagner, Rossini, Liszt, and more. Chameleonic voice actor Mel Blanc’s larger-than-life comic tics defined characters: Daffy Duck’s unhinged lisp, Sylvester the Cat’s spluttering, Bugs Bunny’s insouciant and nasal “What’s up, Doc?” But watch one of the seven-minute cartoons in the vast catalog of Looney Tunes or Merrie Melodies, and you may notice how little dialogue there is. Blanc’s voices were punctuation on top of the cartoons’ whiz-bang orchestral music and sound effects, which followed the onscreen misadventures with every note. Put the music on mute, and you’ve got a first-class snoozer. “When they came out in the 1930s, ’40s, and ’50s, they were made to be seen in movie theaters before the movies. They came to television later. But we were all getting exposed to this fantastic music, and we didn’t even know it,” Daugherty said by phone. “Bugs Bunny at the Symphony II” is Daugherty’s third such show. It and its predecessor shows have brought live cartoon music into concert halls and theaters for over 25 years. Many of the cartoons in this weekend’s performances feature Stalling’s stamp. In his 22 years at Warner Bros., he composed around 600 scores, stitching together seamless collages of original music and preexisting material that matched the action on screen. Because the large, skilled Warner Bros. Symphony Orchestra recorded the scores for the cartoons, he was free to get elaborate. He’d vigorously adapt and remix classical music in many scores, playing with tempos, instrumentation, and sound effects for maximum laughs. (I’m probably not the only kid that grew up thinking “Largo al factotum” from “The Barber of Seville” always included banana-peel squeaks, thanks to the introduction to “Long-Haired Hare.”) He also had a fondness for musical puns, and would sample songs with titles that referenced onscreen happenings; “Oh! You Beautiful Doll” for pretty women or male characters in drag, or “How Dry I Am” for drunk characters. For as much classical music as the cartoons use, they skewer classical music institutions and tropes. “A Corny Concerto” parodied rival studio Disney’s “Fantasia,” with Elmer Fudd parodying music commentator Deems Taylor’s didactic notes. In “Rhapsody Rabbit,” star soloist Bugs Bunny’s rendition of Liszt’s “Hungarian Rhapsody No. 2” is interrupted by a boogie-playing mouse. In “Long-Haired Hare,” the rascally rabbit takes revenge on a puffed-up opera singer who interrupted his banjo practice. He dresses up like conductor Leopold Stokowski, snaps an offered baton in half (Stokowski conducted without one), and forces the singer to hold a high note for a superhuman duration, finally making the theater — which bears a striking resemblance to the Hollywood Bowl — collapse. And this weekend at Symphony Hall, the adventures of Bugs, Elmer, and Daffy will be projected on a huge screen, and the little pauses after gags will be filled with an equally vital part of the cartoon soundscape: laughter.